Hundreds drown off Libya, are you not responsible? For context please check this news item. 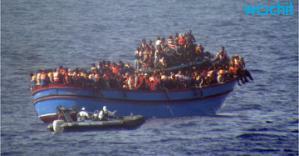 Over 700 feared dead off the Libyan coast after a fishing boat packed with migrants capsized overnight. This is a human tragedy not a border security issue; as some EU leaders are more worried about tightening border security than looking for ways to prevent fatal voyages like this where desperate migrants risk everything, I mean everything in search of better lives. After the amazing liberation of Libya, one would imagine the Libyan people to be enjoying their new-found freedom, instead we hear about migrants dying in the middle of the sea. You won’t hear much about this event in CNN or BBC like the recent plane crash over the French Alps, the mainstream media picked every detail about it for weeks on, yet this tragedy may only be a side note. Obviously war news, ISIS, Yemen, Iraq and related fear mongering news, and tapping into our innate fears about flying etc gets greater coverage for weeks on, but only a slight mention of this human tragedy where the body count could be well over 1000 in days to come, why is this double standard? Is it because the migrant lives matter less? Just for a moment, imagine a picture where a flight with 700 going down, I am sure we will hear about it for weeks on from CNN, BBC, every nity gritty detail about it will be discussed. Yet the stories of these 700+ migrants will be left to rot in the deep-sea, we as humanity will never know why they took such risky ride? We will never know their economic and other life conditions that led them to decide on this journey. And what are the solutions that will prevent migrants from having to take these trips? Why can’t we locally implement solutions that are best for all? That are life supporting, not life draining. I feel as humanity, it is our collective responsibility to prevent these tragedies, all tragedies, by implementing solutions like the #livingIncome or the #BasicIncome everywhere, and least of my concern is tightening the border security as the EU leaders are rushing to do. When life situations are desperate economically or otherwise people do desperate things to escape them and find better lives, sadly not all make it, many die on route. I was one of the lucky ones, who left my home country in desperation to find a better life, even back then not all made it, there are many stories of those who died in the middle of the seas. Their desperation and death should not go in vain, the living must speak up, educate and spread the news about #LivingIncome or #BasicIncome, it is our duty to create solutions, (before our own time runs out). I cant’ imagine the desperate final moments of those migrants, who were packed into a fishing boat, taking a mighty journey in hope of a better life, yet died drowning without any help whatsoever. Humanity like you and me, must be held responsible for this, unfortunately no GOD out there to talk about these things, we have to be the voice for the dead and the living. We must speak up to prevent these calamities for once and for all. If you dare to care, check these sites out, be part of the solution, because mourning or getting angry about these isn’t going to help.